Barbara Floyd holds a copy of the book, From Institutions to Independence: A History of People With Disabilities in Northwest Ohio, she edited. From Institutions to Independence: A History of People With Disabilities in Northwest Ohio, a book published by The University of Toledo Press, will be discussed on “Deadline Now” Friday, April 15, at 8:30 p.m. on WGTE. 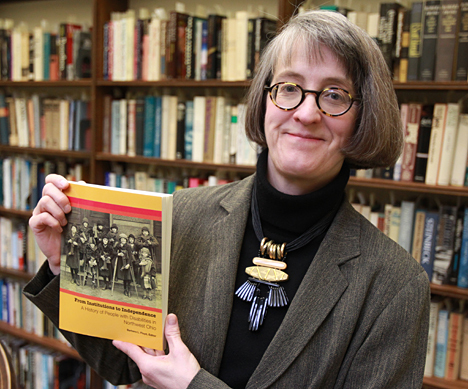 Barbara Floyd, director of the Ward M. Canaday Center for Special Collections, edited the book. She and Dan Wilkins, director of public relations and community partnerships at the Ability Center of Greater Toledo, will be guests on the show, hosted by author and journalist Jack Lessenberry. Wilkins also will discuss the history and services of the Ability Center of Toledo, a center for independent living, which celebrated its 90th birthday last year. The 174-book chronicles how the nation moved from “Attics, Almshouses and Asylums,” the title of the first chapter, to “Hire the Handicapped: Vocational Rehabilitation for Disabled Persons” and “Overcoming Obstacles: From Deinstitutionalization to Independent Living,” in later chapters. The book is an expanded version of the catalog from the award-winning 2008-09 exhibition of the same name. The Canaday Center received the Society of American Archivists’ Philip M. Hamer and Elizabeth Hamer Kegan Award for the exhibit and catalog. The honor is given to individuals or institutions that have increased public awareness of archival documents. In addition, the center received the Ability Center of Greater Toledo’s 2008 Community Access Award in recognition of extraordinary efforts to raise awareness and/or improve the lives of persons living with disabilities and an Ohio Public Images Award from the Public Images Network for the promotion of positive awareness of persons with developmental disabilities. “We are pleased that the UT Press saw the importance of informing the community about this little known part of our history by publishing the volume,” Floyd said. From Institutions to Independence: A History of People With Disabilities in Northwest Ohio costs $20 and can be purchased online at utoledopress.com. This entry was posted on Wednesday, April 13th, 2011 at 4:25 am and is filed under Events, UToday .